You may ask any question or to send an application, proposal filled in margins of a special form and our specialists will definitely contact you in the nearest time. Uralkhimprom Ltd. was founded on September 18, 1997. 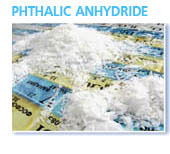 The principal activity of the company is that of production of phthalic anhydride (A technical grade) used for synthesis of alkyd and polyester resins, phthalate plasticizers, dyestuffs, tires and technical rubber products, on the facilities of Kamtex-Khimprom JSC and its further sales. The company is actively involved in the manufacturing process. Besides the deliveries of the basic raw material (orthoxylene) and the sales of phthalic anhydride Uralkhimprom Ltd. also deals with the organization of finished goods shipment and customs clearance providing movable equipment of the railway system and performing all customs procedures. Uralkhimprom Ltd. offers packed motor oils produced by produced by Slavneft-Yaroslavl Oil Refinery JSC and Sibneft-Omsk Oil Refinery JSC ex warehouse in Perm.